Tiger Woods will never officially retire. No golfer ever really retires. Other athletes retire so that they can play golf, and golfers just ... keep playing golf. Retirement in golf for superstars means "transitioning onto the PGA Tour Champions and doing fewer commercials," so why would you hold a press conference for something like that? Woods has too much to lose by making a formal announcement. The future hope of him once again teeing it up and club-twirling his way down the fairways at Augusta National or St. Andrews feeds the machine that is Tiger Woods as a corporation. And the incentive to turn that off is not lofty. So Woods will linger and maybe play a little or possibly play a lot based on how the back feels. This is the line of thinking that we have landed on over the last few months and years. The worrisome part for Woods (and golf) fans with the announcement of his fourth back surgery is the language used in three different statements released by Woods and his agent Mark Steinberg. Let's take a look at them one by one. "When healed, I look forward to getting back to a normal life, playing with my kids, competing in professional golf and living without the pain I have been battling so long." "This is the best and only way to have a healthy, active lifestyle, be able to play with his kids, play golf and not be in pain. You can continue to try and do the band-aid approach, but if you want that healthy, active lifestyle, it was recommended that this is the way to go at this point and the doctor was very pleased with the result. Tiger kind of feels a weight off his shoulders as this is a path to recovery." "He is looking forward to life without pain, looking forward to day-to-day without pain. He's looking forward to playing with his kids without pain, playing golf without pain. He knows he's got a long road, but there's a huge sense of relief right now. His entire emphasis is quality of life and a healthy, active lifestyle. "That includes living day-to-day pain-free, playing with his kids, playing competitive golf, going out in the backyard and having fun with his friends. Getting on his boat and doing what he wants in the water. It's all of that. Living a healthy, active lifestyle is absolutely the priority, and kids and golf and social and all of that's a part of it." The through line here is Woods improving his quality of life. How many times do you see the world "life" or "lifestyle" in those quotes? They read more like someone in their 90s preparing for the final few years of life than someone who just turned 40 trying to win golf tournaments. More power to Woods for this choice, too. I am not saying it's incorrect. I am only pointing out that it sounds like Woods is preparing for a future more rooted in hanging with his kids than hanging pelts from transcendent courses all over the world. 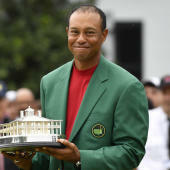 Woods owes us nothing, of course, and I hope the transition into the post-Tiger era (which we are either in or on the other side of) is a graceful one. My pal Brendan Porath wrote wonderfully about that here. It seems as if we are being set up for what that post-Tiger era could look like. After surgery Nos. 2 and 3 in the fall of 2015, the predominant theme was that Tiger would return stronger than ever in 2017. This would be a final chapter in his magnificent magnum opus. We believed that, and we wanted it, too. Now that Woods will be out again, presumably for six months or longer, it seems like there might only be a few pages left to be written in the book on Woods as a competitive golfer on the PGA Tour. Not chapters, mind you, but pages. Maybe even a single page. Nobody, including Woods, knows how this will end. But that's how it feels right now. Woods and his team are smart and controlling of messages and futures. That is their job, and they are good at it. Look back at the statements for surgery No. 2 and surgery No. 3. There is nothing in there about life or lifestyle. It's all about revving up for another run on the PGA Tour. I'm not saying Woods is completely toast as a competitive golfer, though that's probably the case, but we have been primed for a world in which that is a reality. This is the first step in the final real walk of Woods' career. He will most likely still play at the Masters and a few other tournaments, but we have been prepped for a scenario in which he is not competitive at all because of his inability to grind like he used to grind. There is a sadness to this -- for us and also probably for Tiger. But all good things come to an end, and this is one of them. Plus, there is a goodness hiding within all of this misery, and it is that Woods took us (and himself) on one of the most thrilling, super-charged rides in the sports amusement park of the 20th and 21st centuries. Maybe that is no consolation to the most ardent Woods fan or even Woods himself. But there is a joy in having lived through that mania. It was an insane, groundbreaking time in golf. Woods became something bigger than the sport, maybe even bigger than sports as a whole. But that is over, and now Woods just wants to hang out on his boat with his kids without any pain in his spine. The irony here is that everything Woods has ever wanted, he has worked for and received. Now he just wants peace and a body free of agony. That seems like such a small ask after all he's given to the sports world.